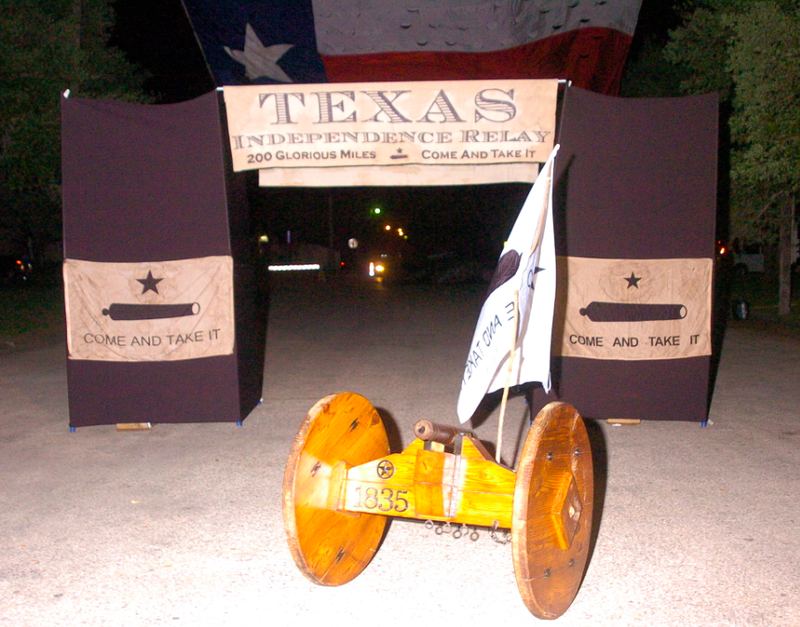 Texas Independence Relay - THE Overnight Relay Race Adventure of Texas! Forgot password? Type your email above and click here. 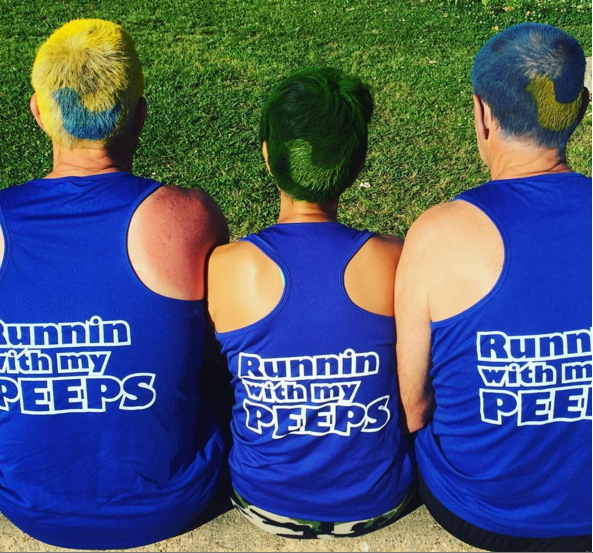 Thank ya’ll for running and supporting the 2016 Texas Independence Relay! Just Carpe'd through and through, you did! 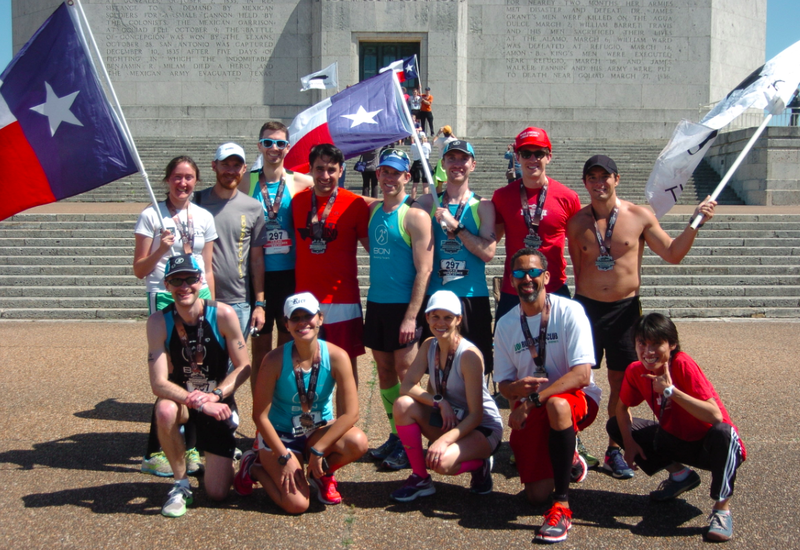 We hope the relay fulfilled your expectations as a fantastic way to experience much of the best of Texas! We have witnessed for ourselves the forming of new friendships and the furthering of established ones on all the teams. On top of all that, we’ve heard some exceptional running and teamwork stories that occurred all over the 200 mile course! We’d love to hear your story too! The weather on Saturday and Sunday this year was about as good as it gets. On Friday, however, it was super windy, so we decided not to put the start line up earlier than necessary, and we were a little bummed to find out during the party that the big Texas flag behind the start line was hanging sadly by one remaining grommet (the rest were completely pulled out). The flag has served for nine TIRs now, and it is a bit weathered to say the least. We asked Gonzales contacts at about 10pm on Friday, if there were any chance to get it down so that we could try to repair it before 6am the next morning. The word came back that they couldn’t make any promises, but they would see what they could do before sunrise (we would not be given the chance to try to repair it ourselves - if we even could). In all truthfulness, we figured we were being told (in the most gentle / polite / respectful way) that we were out of luck. And, what could we really expect? The party was a lot of fun, going a little later than usual, and before we went to sleep we had already dealt with the slight disappointment that the flag would not be up this year (and we were already figuring how we could get it completely down). We were shocked - SHOCKED - that when we arrived at 5:25 the next morning, the flag was proudly up and across the whole street. It was another TIR miracle! We don’t even know yet who all made it happen, but whoever it was, they went above and beyond to welcome everyone to Gonzales. Something like this happens every year, and we have even more stories like this about the TIR!! 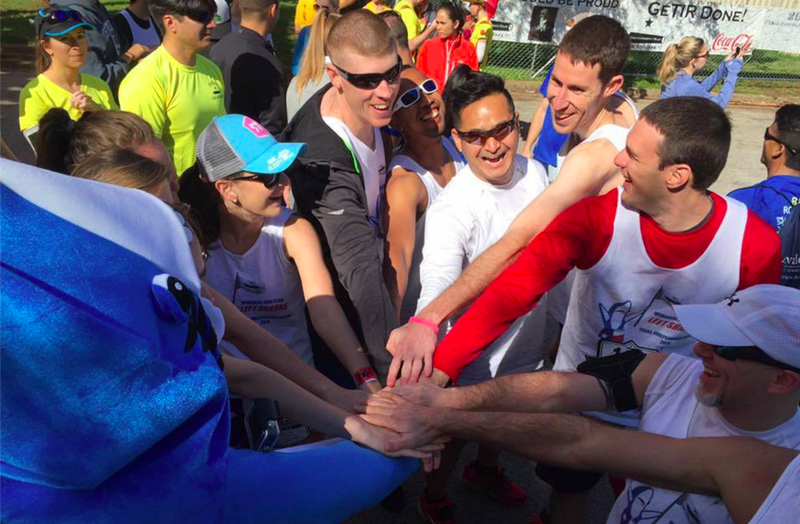 How about Team RWB and the exchange volunteers this year!?!? Simply extraordinary! Chances are that your team experienced something similar where someone went “the extra mile” in service of others to help get someone through, to lighten a burden, or to bring a smile… and in doing so they brought a little more light to the world! We affectionately call you miracle-workers “the TIR family”, and we thank you for it! You are the life-source of the relay that makes it happen! Congratulations to STW Silent Warriors of San Antonio (led by Bridget Delarosa)! They are your 2016 Texas Independence Relay Champions! STW Silent Warriors ran the course in 21 hours and 30 minutes, averaging under a 6:30 per mile pace. The team members are Bridget Delarosa, Arturo Ayon, Daniel Castillo, Eli Quintanilla, Greg Destefano, James Neiner, Jeremy Daum, Machelle DeStefano, Marcos Munoz, Mike Lilly, Richard Calix, and Todd Heintz. Great job! 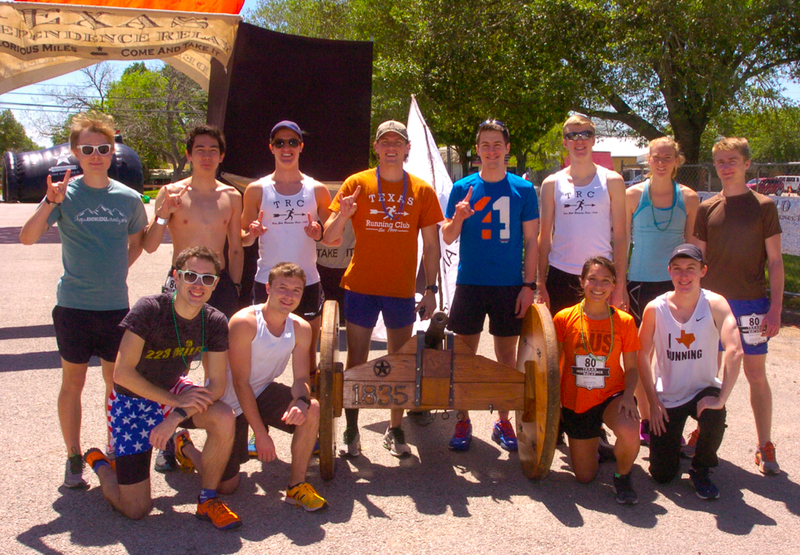 Rounding out the top 3 were the BONa fides (captained by Kyle Smith) of the BON Racing Team from Houston and Hooked & Horny of the University of Texas Running Club (led by Kyle Ray). These two teams actually ran right with each other from about the 3rd exchange point all the way to the finish! That’s pretty amazing. Each team took first place in their respective division (BONa fides - Open Mixed, Hooked ‘n Horny - Open Men). The Overall Women’s team winner was Sisters With Blisters of Austin! 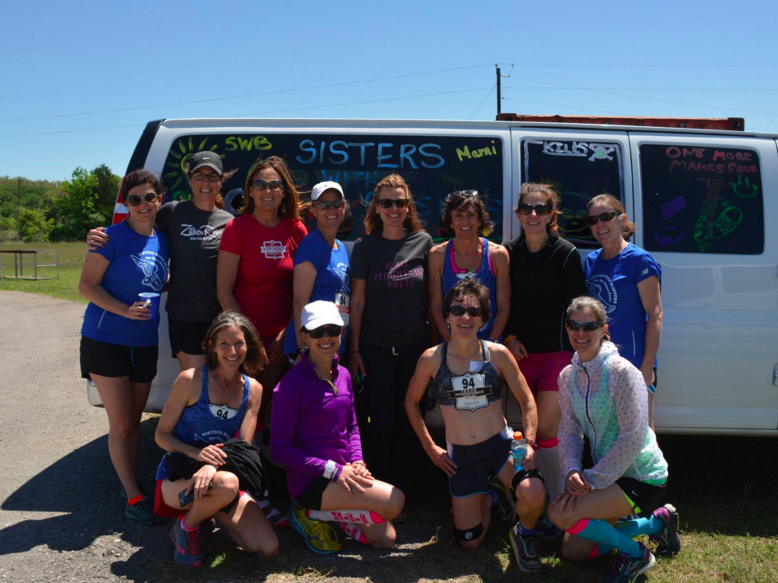 Led by Amy Moore, Sisters with Blisters is a fast group of girls who are also a ton of fun, to boot! The Tenaris Turtle Team (anything but Turtles!) led by Gabe Belforti ran a superb relay to win overall in the Corporate division! Not only did they win the Corporate Cannon, but they also finished 6th overall in the entire race with their excellent 7:19 per mile clip. Other notable races included the Chevron Accelerators (Bob Sevin) winning Corporate Mixed again by just barely nudging ahead of IDEA: Running Many Next Steps (Idea Public Schools & led by Larkin Tackett) by one second per mile. The Planks 4.0 (Mark Callahan) and Planks 5.0 (Randy Keith) won both the Masters (over 40) and Veterans (over 50) categories, with the Planks 5.0 setting the new Veterans record with a 7:28 pace (24 hours 49 minutes). 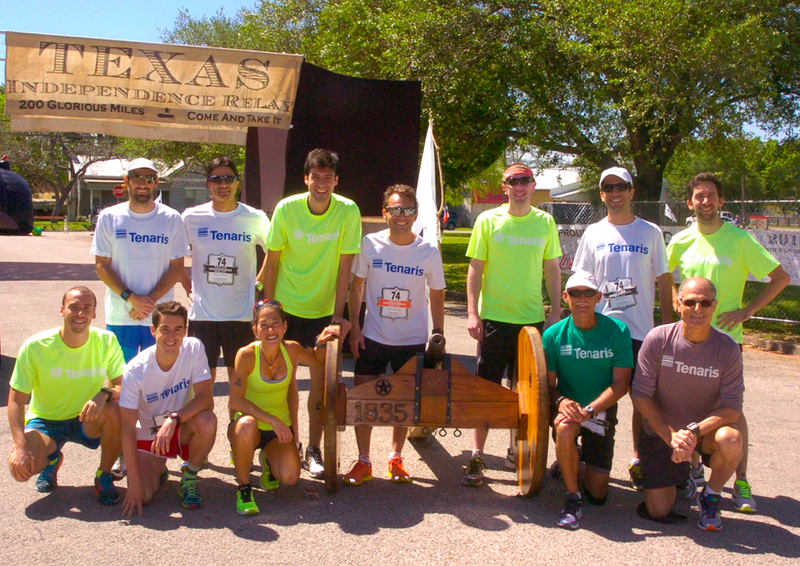 The 9 year team, Corpus Christi Roadrunners (Rich Martucci) valiantly defended their veteran record, running under 26 hours themselves. The first year team LeeRoy's Lawmen (Robert “LeeRoy” Arbegast) were victorious against all the Armed Forces teams. They were quite memorable as the guys with the Texas shorts and black shirts who were able to somehow continue to appear quite imposing nonetheless! 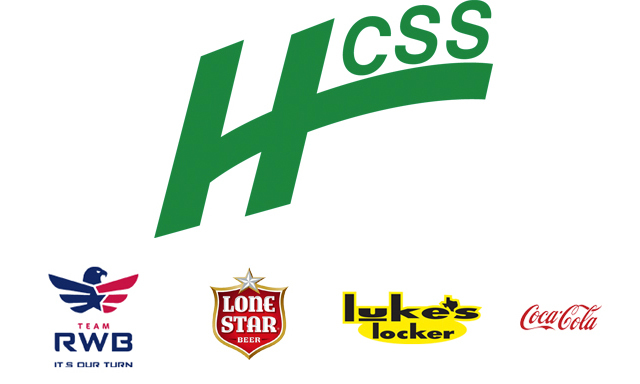 HCSS Fast Track (Dalton Pulsipher), representing the headlining sponsor of the TIR, won the Corporate Mens division. Victorious Secret (Veronica Padilla) won the Open Womens division with flare. 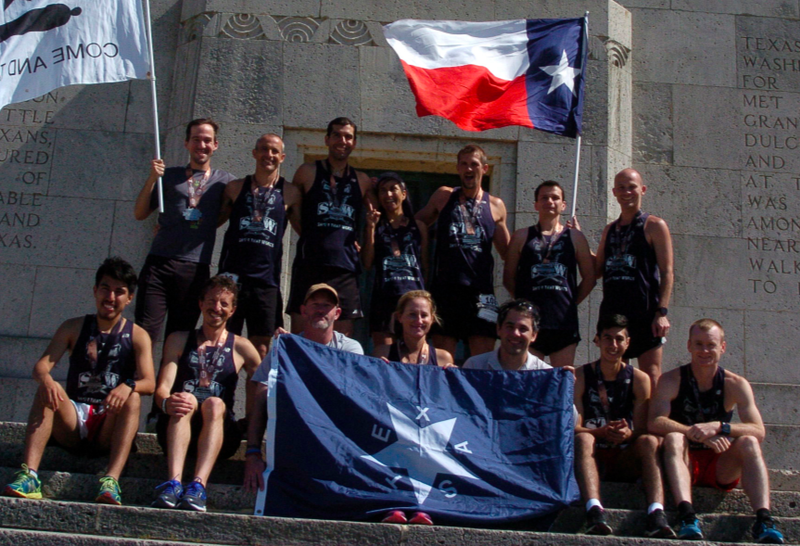 Finally, DALLAS DOES HOUSTON, a mixed veteran team (captain Terry Ziegler) beat their own course record from 2010, covering the course at a 7:44 pace - That is fantastic! I think they just proved that age is just a number. Finally, though not an "official" entrant to the TIR (as it is a relay race), we recognize Matt Zmolek for the remarkable achievement of finishing the TIR solo run in 55 hours 35 minutes - The best time yet. Incredibly Impressive. However, though it was a “solo” effort, I think Matt would tell you himself that it is every bit as much a team effort. 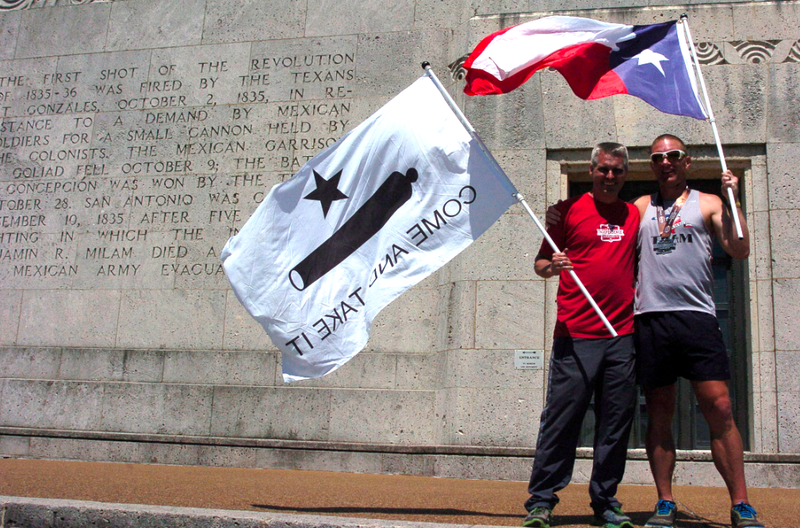 His support and crew (headed up by Rob Goyen of Trail Running Over Texas) were vital to his achievement. Congrats to Matt and all! Determining the Texas Spirit award winners is probably one of the MOST challenging aspects of the race. We can easily name 20 teams with a great case of why they deserve to win, so if you feel that you were robbed (if you don’t win), know that we wholeheartedly agree… But also know that your exceptional spirit benefits everyone, yourselves included, and it is what makes you the awesome team that you are! 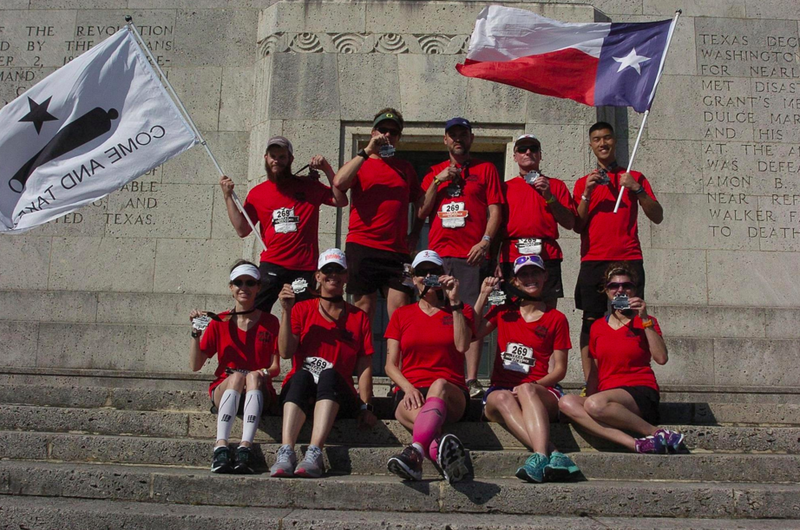 Texans Running Texas (Chris Weir) - A first year team that instrumentally helped a veteran team get back to racing without even missing a beat after they locked their keys in their van. Again, there are so many worthy teams for this award. Thank you! The winners of the photo contest will be named on the TIR’s facebook page tomorrow, April 8. Submissions may be made until midnight tonight (4/7). City of Gonzales, Mayor Bobby Logan, City Manager Allen Barnes, Economic Development Director Genera Young, Parks & Rec Manager Tim Patek, and many others. And of course, Joy Hilscher, who is more behind the scenes, but every bit as much Race Director. I hope we are not overlooking anyone, but chances are good that we are… apologies in advance for that. All of these people are key and do excellent work. If you would like to help out for the 2017 version of the TIR… the Bigger and Better edition!... Please let us know! 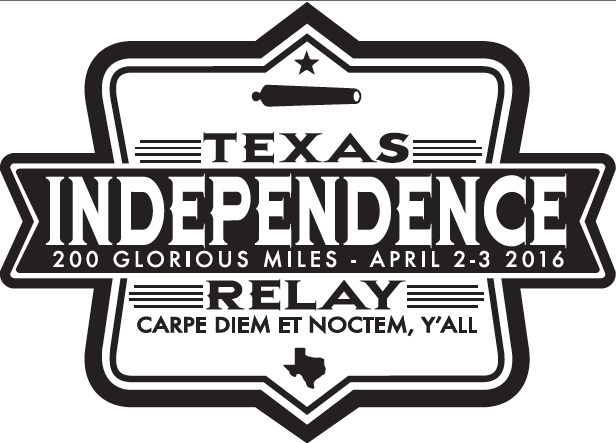 Next year’s Texas Independence Relay will be back to the last weekend in March, March 25-26, 2017! We already have plans on how it is going to be an improved version (though we’re proud of this year’s, for sure!). Registration opens tomorrow with the first 20 teams getting the price of $1,000. Or, you may elect to initiate your team by entering as an individual for $100. (Quick note: Individual entries are NOT deferrable or refundable, and the price a team captain may get does not lock in any other team members at that price.) If these 20 spots go really quickly, we will honor the $1,000 price until at least 6pm tomorrow. 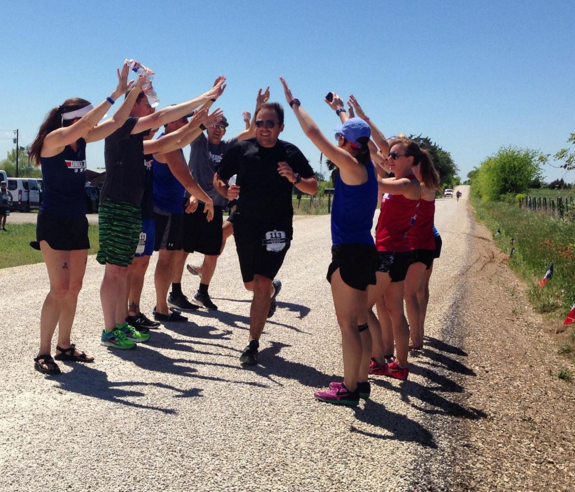 Experience your own epic victory at the Texas Independence Relay! Your ~200 mile journey traces the route of Sam Houston and the Texian army, beginning in historic Gonzales (home of the Come & Take It skirmish) to the site of the storied final battle for Texas' Independence at the San Jacinto Monument! Please contact us at any time. We look forward to hearing from you!! March 2 - Texas Independence Day! March 31 - TIR Finish! REGISTER NOW FOR YOUR OWN GOOD BEFORE YOU WUSS OUT!!! !